SAIL Collieries Division Jobs. Official website to online form submission is www.sailcareers.com. Online form link will be active from 14-02-2019 to 10-03-2019. Candidates who are interested they can apply online before the closing date. 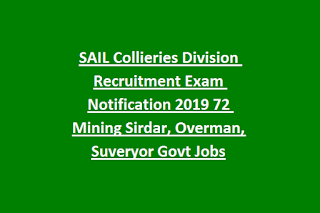 Candidates selection will be based on written exam, Skill Test or Trade Test for this SAIL Mining Sirdar, Overman Recruitment 2019. For more details about this SAIL Recruitment qualification, post wise vacancies and more is updated below for this Mining Sirdar, Overman Jobs. 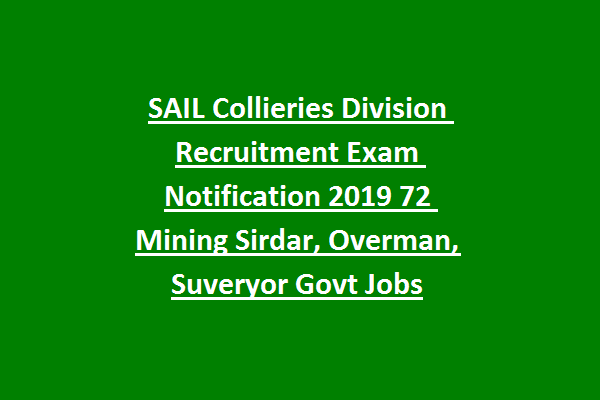 There are total 72 posts are in this SAIL Collieries Division Recruitment 2019. Post Name and no of posts are given below. As on 10-03-2019 upper age limit is 28 years for general candidates. Upper age limit for BC candidates is 31 years and for SC/ST 33 years. For all the posts minimum one year experience is required to apply. Candidates selection will be based on written exam, skill test or trade test. For exam pattern and Syllabus refer official website of www.sailcareers.com. Online applications only accepted for this SAIL Recruitment through official website of www.sailcareers.com. Online form submission last date is 10-03-2019.